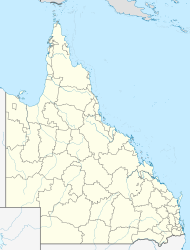 Mount Kynoch is a suburb of Toowoomba, Queensland, Australia, located 6 kilometres (4 mi) north of the city centre. At the 2016 Australian Census, the suburb recorded a population of 237. Originally a trigonometric station known as Stony Pinch, both the 703-metre (2,306 ft) mountain and the suburb were named in 1981 after John Kynoch, an early chairman of the Shire of Highfields. Initially misspelled "Kynock", the name was corrected in 2002. Mount Kynoch Lookout and Mount Kynoch Water Treatment Plant are located within the suburb's boundaries. ^ a b Australian Bureau of Statistics (27 June 2017). "Mount Kynoch (State Suburb)". 2016 Census QuickStats. Retrieved 25 March 2018. ^ a b "Mount Kynoch (entry 42898)". Queensland Place Names. Queensland Government. Retrieved 5 June 2011. This page was last edited on 25 March 2018, at 03:54 (UTC).